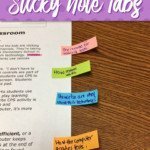 We are always looking for more ways to keep our studentsmotivated…dry erase sleeves can help! Are you struggling to keep students motivated? When you take out pencils do your studentsstart to whine? I hear ya. I have been there. My students struggle all day in theiracademic classrooms. I like for them to feel confident, motivated, and willing to take risks when they come to my speech room. 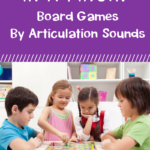 I am always looking forways to make learning a bit more fun and exciting. 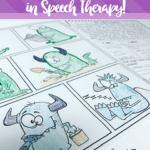 If it means letting the write with something different than they normally would…it works for me! There is something so motivating aboutwriting with a dry erase marker! Best part…even if they make a mistake…it is OK..they can erase and keep going! See below how I used a dry erase sleeve (or a page protector…does the same thing!) to make completing this tier 2 vocabulary word dictionary a bit more fun. CLICK HERE to check out the activity. No time to get to the photocopy machine? Hate having millions of pieces of paper? Hate having extra copies you don’t know whatto do with? 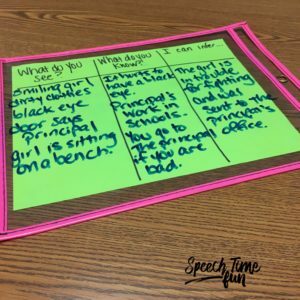 Just print out enough foreach student in the group, put the worksheet inside, and you have an activity you can use with every group! You just needed only a few copies! 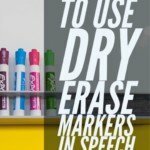 Let your students erase when the session is over to prepare for the next group coming into use the same activity! 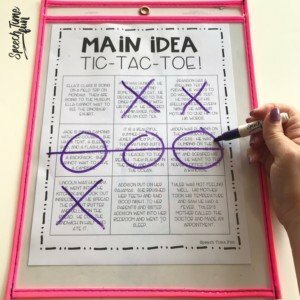 See below how I used the dry erase sleeve to play tic-tac-toe without having to print out amillion copies or erase pencil marks. Wegot to play over and over and have so much fun. 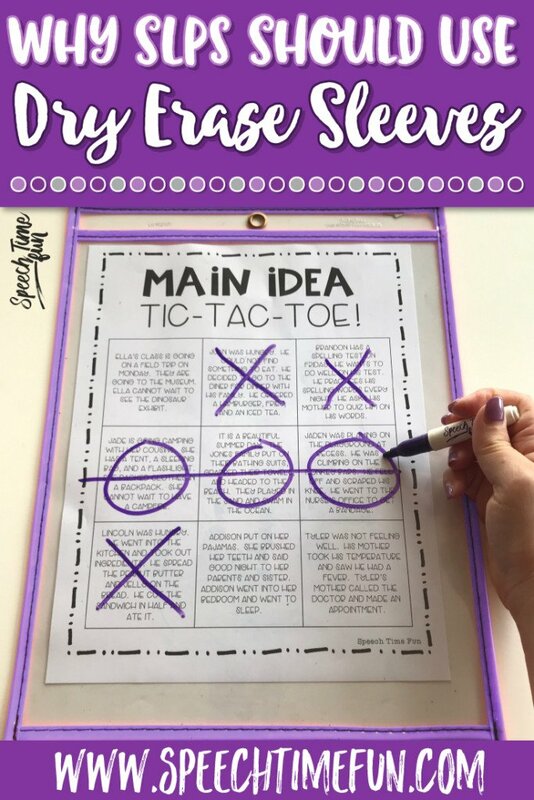 (CLICK HERE to grab the freetic-tac-toe game). 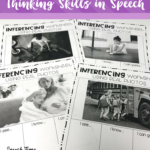 Ever want to use a graphic organizer or activity to practice multiple times in a session but don’t want to have a million copies? Just use a dry erase sleeve! 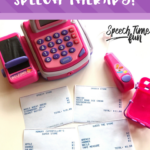 Let them work out their answers, practiceusing that sentence strip or carrier phrase, write down their key wordsheard…and then erase and do it again for the next practice opportunity. I love doing this when I have students use a graphic organizer to comprehend and infer using pictures like with Norman Rockwell art. CLICK HERE to read more about this idea. 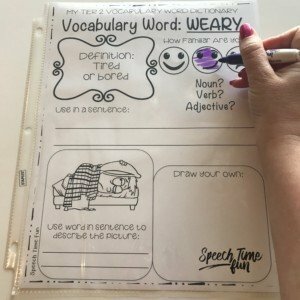 To make worksheets and activities dry erasable you canlaminate it (but who has time for that) or you can use a page protector if youhave some handy. You can also grab astash on Amazon to keep in your therapy room. I know sometimes people spot them in the Target Dollar spot or dollarstores but I have never been so lucky. Therefore, I typically stick with Amazon. CLICK HERE to check them out!